He moved to England with his mother at an early age, attended school there and later studied in Germany and France. He became a naturalized British citizen and served in World War I. After the war he was a journalist in London for a time then he moved back to the US, eventually living in southern California where he went to work as a bookkeeper for an oil company. When he lost his job in 1932 he returned to writing and published his first crime story in 1933 in “The Black Mask,” a pulp journal that also published Cornell Woolrich and other up-and-coming detective writers. 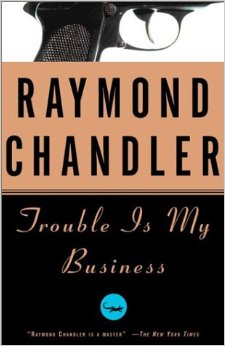 For all his influence and prominence, his output was relatively modest compared to many other crime novelists, this owing to the fact he was in his 50s when he wrote his first novel, “The Big Sleep,” in 1939. He wrote seven novels–almost all household names to mystery readers–and about two dozen short stories and novellas.